Further proof that collectible card games no longer need be collectible nor a game. Flash forward to the present, the most popular trading card game on the market is Pokemon, a sub par game with admittedly high collectible value. Pokemon almost single handedly took the "game" out of CCG's by lowering their audience to a level of collector who can't comprehend or doesn't care about the complex gameplay that a "collectible" game requires. Now every other major anime license is rushing to join the CCG exploitation craze: Dragonball Z, Digimon, Sailor Moon, Ranma ½ (remember Animehem?) in America, and Yu-GiOh!, Card Captor Sakura, and dozens more in Japan. Now Bandai has followed suit by releasing their own Gundam Wing CCG. Even though the game comes out after the show's boom in popularity, it is still a rushed product that despite some innovative gameplay features, still needs some tweaking in order to make it playable. Visually, these are some of the worst cards on the market. The backs of all the cards show a black and white battle between two unidentifiable MS. No color?! Are they that cheap?! It looks that way. The front of the cards have adequate images, but lack the high quality gloss of CCGs from Wizards of the Coast. An annoying side note that will spoil your first few games is that all of the hologram cards, whether in the starter or the boosters, comes slightly warped, so that your deck will have a pocket in it wherever there's a hologram. The MS artwork is either lifted from the anime or is a CGI render. All other images are pure anime video captures. Each starter deck also comes with six cardboard tokens and a playmat. A further example of Bandai's lack of care is that the playmat has room for just four tokens when the game gives you (and requires) six. The gameplay is fairly simple. Each player (it's a natural two player game, but the rules keep on hinting at, but not explaining, a three or more player game) chooses between an Oz or Gundam Team deck. The basic starter set of 32 cards comes in both varieties, so that all one needs to start playing is both starter decks. 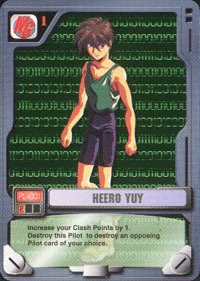 Card types include MS (Mobile Suits), Pilots, Battlefields, and Events. Pretty simple. You fight with your MS, give them Pilots to boost their stats, use Battlefields to give yourself a long term benefit, and use Events for a one time boost or smiting. Each card has a cost to bring it into play ranging from 1-5. When paying this cost you must discard that number of cards from either your Supply Deck (draw pile) to your Dry Dock (Discard Pile) or from your Dry Dock to the Demolished Pile (Out of Play). As a game ends when you run out of cards in your supply deck, there is a lot of strategy involved in deciding when and what to play. Combat is done by selecting MS that you have in play (with or without a pilot) and sending them to the battlefield. The defending player then can assign any of his MS to defend these attacks, or let the attacks get through and take the damage directly (which means discarding that number of cards from the supply deck). A MS that attacks can't also defend, so if you have a super-cool MS like Wing-Zero, you must pick whether to use it for offense or defense. Each MS has a "Clash Point" score which equals how much damage they deal. Pilots or Events can modify this amount, and whoever has the highest number wins. In the case of a tie, both cards are discarded unless one has "Preemptive Strike." It's similar very similar to Magic's combat system, and that's a fine thing. Victory occurs when a player meets their mission objectives (each starter deck comes with two possible mission objectives) or when one player runs out of cards from her supply deck. In all of the games I played, the cards always run out before a mission can be completed. In fact, using the "Ace" type of gameplay (30 cards per player, or basically, one starter deck each) games are over in just a few minutes because you go through your deck so quickly. In order to have any kind of balanced game, you MUST play by the "New Type" rules and use 50 cards per player. Of course this has its problems too, as the New Type rules say that as you approach your goal, you must use cards from your own deck to create a rebel faction that attacks you (representing White Fang). This sounds OK in theory, but when you are blowing through your cards too fast already, the last thing you need is another team forcing you to discard all the time. So I would strongly suggest, use 50, or even 60 card decks (every other card game's standard) and ignore the Rebel Forces rule. This game is potentially pretty fun. What keeps it from really being a fun experience is the fact that one in four cards makes you scratch your head. Many MANY rules are unclear and are barely explained, and many cards are completely illogical. Take for instance the powerful Epyon card: It says "Opponent cannot take damage from their supply deck" which I assume means, If I attack you and you can't block, you don't have to discard anything. OK, that's fair- otherwise he'd be too strong. But then, in the rules it says that a player can chose whether or not to block an attack. So if I attack with Epyon, even if my opponent has some weaker MS with which to block, he's not going to do it because they'll die, and so Epyon goes unblocked and does nothing. Thus I wasted my attack and now I can't use Epyon to defend. From then on, Epyon was a defending card, which makes no sense, as Epyon is the most offensive MS in the anime. What I think the card MEANT to say is that "Opponent must block Epyon if he has any available MS. If there are no defending MS, Epyon does not deliver damage to the supply deck." That makes it work. Another stupid card is the "pilot" Dorothy. Her added effect is that when you have her in play "All of your MS must attack each round." What!? Why play a card that forces me to attack each round? I want the ability to choose my own attackers and defenders. What I assume the card mean to say is "All of Opponent's MS must attack each round." Now that'd have a big effect on strategy. Dumb gameplay or sloppy writing? I think it's the latter. There's also the extra gameplay element of MS "types" like Magnarac (sand-type) and Cancer (sea-type) Certain cards say they can only be blocked by a certain "type," but as there are only about 5-8 "type" cards available in the 120 cards, the actual types are hard to work into actaual strategy (unlike Pokemon or Magic where every card has a "type"). Basically, If you're playing a game using the starters, a card like Magnarac ("only sand type MS can block") is invincible as the other team doesn't come with any sand type. Good concept for a game with 150 different MS, but a lousy feature for one with 30. The collectibility factor of Gundam Wing: MS War is extremely limited by the fact that there are just 120 cars and 60 of them can be had in the starter decks! The actual number of different cards is around 90-100, as there are a quite a few variations on the same card. With 10 cards per pack with no duplicates per pack, you could assemble a complete set in just a dozen boosters! There are hologram cards packed in 1:3 packs, and gold stamped cards in 1:11, but of the six boosters I opened, I got 3 gold stamped and two holograms. Luck or marketing fraud? Taking a note from Star Wars and Star Trek CCG's, where fans were outraged at not being able to get their favorite main characters with out buying hundreds of cards, Gundam Wing starter decks come with ALL off the main characters and MS. The booseters contain variants (just how Star Wars CCG works now), but the originals are almost as good. This is nice from the gameplay point of view, but screws up the collectibility factor as any 10 year-old who buys a starter gets every character they know and thus has no incentive to buy boosters to get the rare guys. Because there are so few cards, there is really no reason to make this game a CCG. If Bandai had ironed out a few rule wrinkles and made this a stand alone boxed set, it would have been a lot of fun. Of course, no one actually buys card games to play them anymore, do they? Despite some innovative features that a thinking game designer slipped into the rules, this is obviously a hack job by Bandai to cash in while they still can. If you're a serious Gundam fan, you can probably find these cards on sale in the not to distant future and get yourself a complete set for the cost of a Gundam model kit. Of course, if you actually want to play the game, you'll have to finish making up the rules that the designers gave up on half way through.